Corporate finance executives in the US are eagerly tracking a piece of federal legislation that could save companies billions of dollars when funding their pension programs.The provision,part of a bill known as the Pension Preservation and Savings Expansion Act of 2003, would change the interest rate benchmark used for calculating the minimum funding obligations of defined benefit plans. Right now, corporations must use a low interest rate based on the defunct 30-year treasury bond that forces them,they say, to kick in more money than is truly necessary to keep their pension plans financially sound. The use of an interest rate based on a composite of longterm, conservative corporate bonds would more accurately reflect market conditions, a mix of business and labor proponents argue. Since the interest rate would be higher than the rate on the 30-year treasury bond, the revision would reduce the amount of funds that corporations must shift into their pension plans each year and free up a considerable amount of money. Awful as it may sound, corporations with many blue-collar workers could get a break in their pension funding obligations because those hardworking, burly steel and auto workers typically live shorter lives. One of the provisions of a comprehensive pension reform bill now before Congress would let companies use different mortality schedules for union workers. And since some actuarial data shows that union workers do not live as long as their non-union colleagues, corporations with large numbers of union workers could place less money into their defined benefit plans each year. Mortality assumptions, along with benchmark interest rates, are two of the prime factors that plan actuaries must use when calculating how much money a pension plan needs to be able to pay its workers once they retire. Right now, plan sponsors must use the same mortality tables for all workers. The revision in mortality tables is one provision in the pension reform bill designed to more accurately reflect the actual costs of the defined benefit plans and, perhaps, encourage companies to keep offering them. Experts don’t expect this provision, part of the Pension Preservation and Savings Expansion Act of 2003, to get through Congress this year, however. Executives and financial analysts are especially rattled because a temporary legislative fix that lets plan sponsors use a more flexible benchmark for calculating their funding obligation rates expires at the end of this year. That provision, part of the Job Creation and Worker Assistance Act of 2002, increased the range of permissible interest rates to 120% of the four-year weighted average of the current 30- year treasury rate. 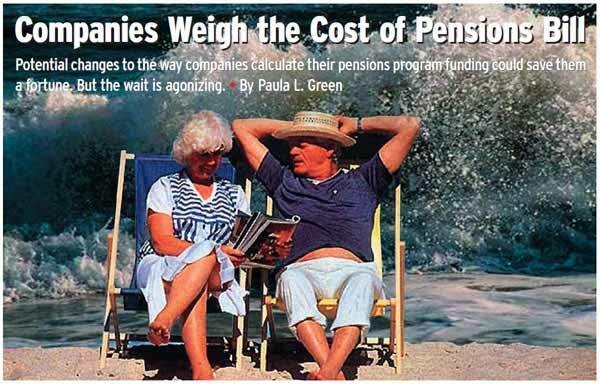 But when it expires, pension plan actuaries will be forced by law to re- turn to a lower benchmark rate.The cost for individual companies in 2004 will range from millions to hundreds of millions of dollars. General Motors’ recent announcement that it will be topping up its pension fund with the proceeds of a more than $10 billion debt offering—the biggest corporate bond issue ever— gives an indication of the magnitude of the problem companies are up against. “This is a huge financial issue for many companies. CFOs have to ask themselves,‘What is my next step here?’” says Bob Shepler, director of federal affairs for Financial Executives International, an organization for financial professionals. Shepler works in the Washington, DC, office of the Florham Park, NJ-based group. 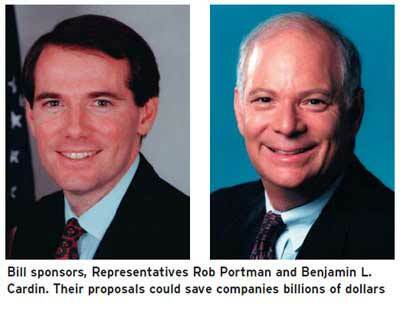 CFOs are hoping the current legislation—known as the Portman-Cardin bill for its sponsors, Representatives Rob Portman (R-Ohio) and Benjamin L. Cardin (D-Maryland)— or at least the provision regarding pension interest rates will be approved by the third quarter of this year so they can plan their 2004 budgets accordingly. And they aren’t very happy with some congressional efforts to provide another temporary solution to the interest rate dilemma. Corporations are already being squeezed by pension funding shortfalls in order to make up for three years of plummeting equity returns and some of the lowest interest rates in four decades. A study released last fall by Credit Suisse First Boston that focused on the 360 plans in the S&P; 500 Index, for example, estimated that the plans could be underfunded in aggregate by $243 billion by the end of 2002. The AFL-CIO supports this reform because labor worries that if the plans become too expensive, companies will simply drop the defined benefit plans as an employee benefit, says Judy Schub, managing director of pension and investment policy for the Association for Financial Professionals in Bethesda, Maryland. “The fear is that if these plans are made so expensive, companies will try to get out of them,” says Schub.“The unions feel it is better for working people, and they don’t want to see the plans driven out of existence.” Officials at the AFL-CIO in Washington, DC, could not be reached for comment. Another corporate concern is that the financial analysts who cover publicly traded companies dislike the uncertainty surrounding an individual corporation’s possible outlay of tens of millions—or even hundreds of millions—of dollars. Such uncertainty isn’t good for their stock prices. Proponents of the Portman-Cardin bill are optimistic that the two congressmen, who were successful in getting the Comprehensive Retirement Security and Pension Reform Act through Congress as part of the 2001 tax relief act, also will be successful this time around. Introduced in early April, the legislation now sits before the House Ways and Means Committee and the House Education and Workforce Committee. The problem with the benchmark rate used for funding calculations began several years ago when the US treasury department was running a surplus and began buying back 30-year treasury bonds—sending the price up and the interest rate down.The problem worsened in October 2001 when the federal government decided to stop issuing the bonds.